FILE - A general view of the Myanmar parliament in Naypyidaw. Myanmar's parliament has dealt a significant blow to opposition leader Aung San Suu Kyi's chances at becoming president, rejecting a bill that would have ended the military's effective veto power over constitutional changes. The longtime democracy leader and Nobel Peace Prize winner said she was "not surprised" at the results of the vote Thursday, which followed three days of emotional debate by her fellow lawmakers. Myanmar's parliament is currently dominated by the military, thanks to the 2008 constitution, which gives the army a mandatory 25 seats. The rejected bill would have lowered the threshold from 75 to 70 percent, essentially removing the army's legislative veto power. 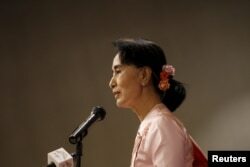 FILE - Myanmar pro-democracy leader Aung San Suu Kyi gives a speech during a World Press Freedom Day ceremony in Yangon, May 3, 2015. The constitution also currently forbids anyone with foreign children from running for president. That means Aung San Suu Kyi, whose sons are British, is ineligible, despite being immensely popular in Myanmar. Aung San Suu Kyi's opposition National League for Democracy is expected to gain a significant number of seats in parliamentary elections set for later this year. Despite parliament's decision, she said the group will not stop pushing for democratic reforms. Nonetheless, the parliament's decision is seen as a setback for Myanmar's political transition, which began in 2011 when the military, which had ruled the country for decades, handed power to a mostly civilian government.